The ocean waves have always been a refuge for those seeking respite from a day-to-day life full of appointments and obligations. 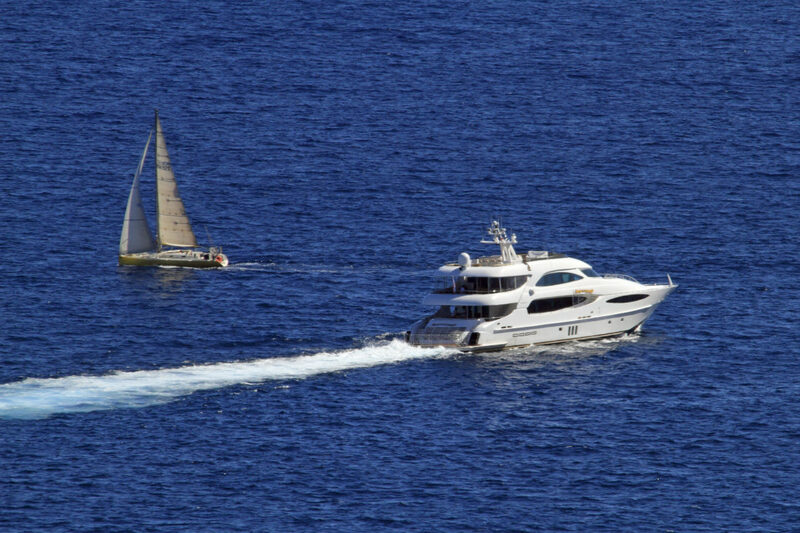 Out at sea, the wealthy can enjoy the relaxation and privacy they find so hard to find on dry land. According to a new report compiled by yachting service Camper & Nicholsons and Wealth-X, these two factors are continue to power the luxury yacht business along in 2016. A luxury yacht, the report confirms, is not just a status symbol: “People of my generation prefer to enjoy luxury rather than show it off,” says Gualtiero Giori, Executive Chairman of Camper & Nicholsons. 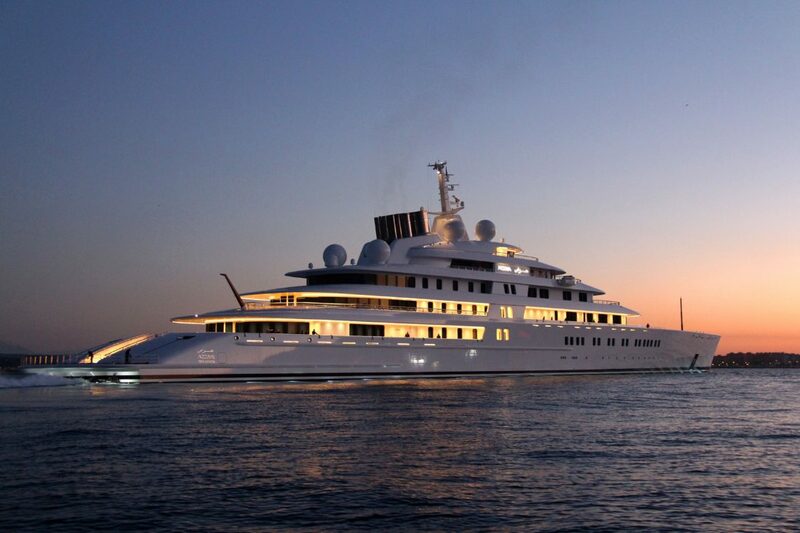 According to the report, USD 20 billion a year is spent on building, chartering and operating superyachts. Much of the total is accounted for by the 300 or so yachts delivered to customers over the last two years. Manufacturers believe the market has plenty of potential for the future too: there are an estimated 200,000 households of “ultra high net worth individuals” around the world, which between them own 4,476 yachts of 30 meters or more in length. Currently, a yacht like this costs around USD 10 million, but the experts believe that prices are set to go up. The mood in the industry is good, with 455 yachts on the order books for the next few years. Almost half the total number of superyachts sold as at July 2016, were built in Italy, so its boat builders should do particularly well from the trend. The other leading producers are the USA, the Netherlands and Turkey. "People of my generation prefer to enjoy luxury rather than show it off." 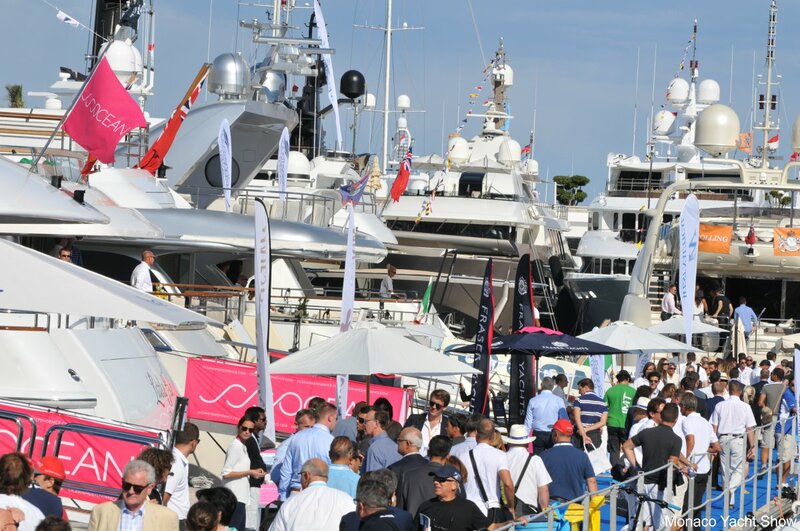 Discretion is the watchword in the yachting trade as in all other industries that do business with the wealthy. However, discretion has its limits. 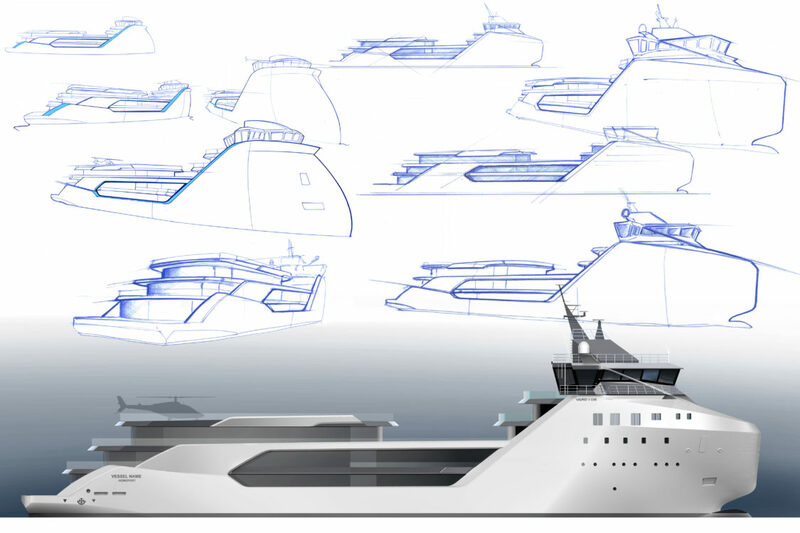 As far as possible, superyachts are built away from prying eyes, but their sheer size and the complexity of the manufacturing process mean that it’s becoming increasingly difficult to maintain complete secrecy. “Thousands of people are involved in building these yachts. Confidentiality is extremely important, but as soon as the boat is in the water, the cat’s out the bag, as it were” says Peter Lürssen, CEO of Lürssen Yachts (Germany). The successful boat builder made this comment as a customer took delivery of the 180 metre “Azzam”, the longest yacht in the world. Even in the vast dry dock at the shipyard, it was difficult to keep the boat under wraps. Even without this latest record-breaker, the yachting business would be generating impressive figures: the average length of the yachts currently on order is 50 meters. That’s 9 meters longer than the average for boats now on the water, and 5 meters longer than the figure for 2015 orders. The additional length creates space for new features, and today’s luxury yachts can offer all the comforts of dry land, whether it’s a fitness studio, a full multimedia set-up with cinema room, a swimming pool with waterfall or an exclusive kitchen for the star chef. Anyone with a taste for real extravagance could also order up beach-level access to the sea or even an on-board submarine. Despite the huge variety of individual differences, yachts can basically be divided into two groups: those that concentrate on the greatest possible luxury, and those designed for a degree of adventure. The latter can, for example stay out at sea for longer, cope with ice or cruise at very high speeds. Most superyachts are built individually to suit the owner’s needs and tastes, and this level of individuality can make them hard to sell subsequently. Then again, an individual design can turn a yacht into a sought-after style icon. 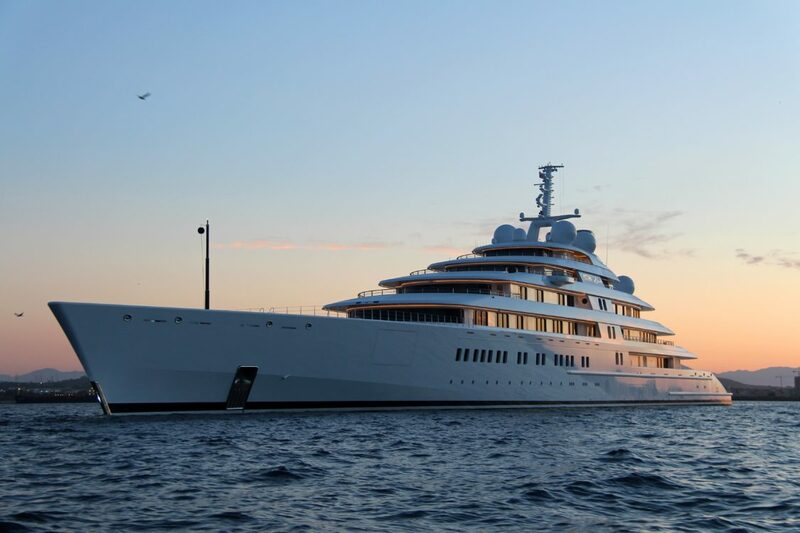 According to Forbes, Mexican TV mogul Emilio Azcarraga Jean recently had to lower the price of his luxury yacht “TV” from USD 144 million to USD 102 million. Still a good deal, since he bought the yacht new for USD 78.4 million. Yacht fanatic Andrey Melnichenko is apparently selling his Philipp Starck-designed Motor Yacht A for USD 300 million, having originally bought it for USD 200 million. Even Vanity Fair, the American style bible, struggled for words when news of Steve Jobs’ superyacht Venus became public, describing it as an “unidentified floating object of aluminum and glass”. Philippe Starck worked with Apple’s legendary founder to produce a unique design icon that to many seems truly otherworldly. The story behind the development of the emphatically minimalist concept is poignant. Jobs and Starck met once a month for four years to work on the project at the living room table; but tragically, Jobs died before the yacht could be delivered in 2012. The unique 78.20 meter vessel was built by Feadship in the Dutch town of Aalsmere. 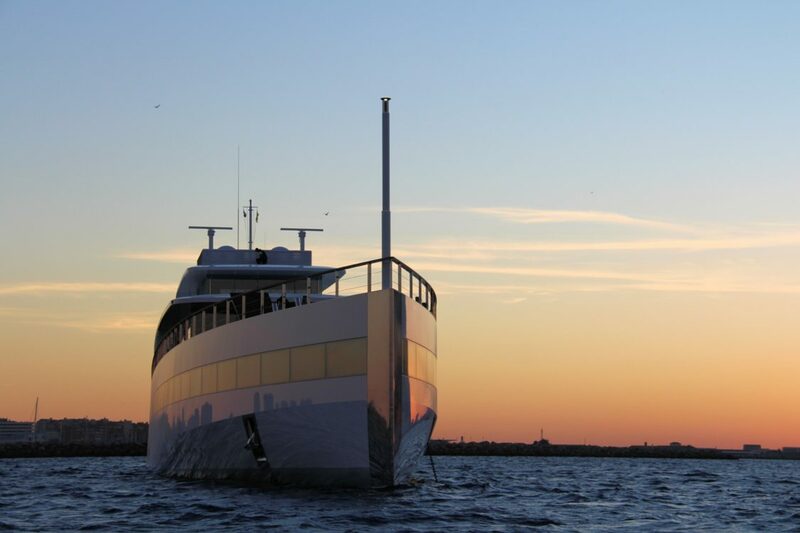 Part of Venus’s timelessly modern elegance comes from the very straight lines of its aluminum hull. Its extended ribbons of window also play a part. The yacht has a playful, mirrored bow, while the deck is floored classically in teak. Large hatches open when required to provide access to the water for swimmers, or for the yacht’s dinghy. A crew of 22 sail the boat and take care of guests. All the other equipment and features spread across the motor yacht’s four decks are the subject of much speculation. As is usual in this business, the people involved in building the boat have preserved a veil of discretion to protect the Jobs family. Media reports suggest the price tag for Venus was more than USD 100 million. Venus hit the headlines at its launch and then again barely two months later when the yacht was seized in the port of Amsterdam after designer Philippe Starck said he was still owed money for his work. The dispute was settled with a payment of €3 million, and Venus is now where she belongs – out on the ocean, visiting some of the world’s most beautiful harbours. At the beginning there was only a speculative idea: yacht broker Edmiston & Company contacted the yacht designers at Bannenberg & Rowell to see if they thought the SUV concept could be taken across from the world of cars to the world of superyachts. The specific mission was to turn a workhorse of the high seas into a luxury ship with the range and ruggedness to deliver unprecedented freedom on the oceans of the world. For creative director Simon Rowell, the tried-and-tested hull of a ship built by Vard to supply oil rigs and remote islands was “a practical and honest platform” on which to build a superyacht SUV. It might seem a crazy idea at first, but the concept is actually the result of careful study. “Our demographic research tells us that a younger and more open generation is coming through,” says Simon Rowell. “Some of them are keen to pursue various activities on and in the water to an ambitious level; some want to have an adventure in new regions beyond the reach of traditional yachting.” Kilkea lets adventurous seafarers stay at sea independently for up to a month, and it can cope with ice and severe weather when required. But this nautical flexibility has its price: “We’ve taken the whole basic structure and body of the original boat, including the hull and the technical areas,” explains Simon Rowell. As a result, the towering superstructure, as used on a supply ship, dominates Kilkea’s bow, giving it a functional, rather than an elegant look. However, the rest of the ship is blessed with one of the most beautiful designs in modern yacht building. “From the main deck up we have used a new structure of our own.” The computer renderings published so far are only provisional, however. “Various plans are still possible. There’s room for guest quarters, dining rooms and a lobby area; it’s very flexible,” Rowell explains. It will be interesting to see how the finished yacht looks. Edmiston & Company are still looking for a maritime adventurer who is prepared to invest USD 72 million in this very special dream. American car magnate John Staluppi has turned his obsession with speed into a new business idea. In his younger years he was already living life in the fast lane, driving cigarette boats, motorcycles and corvettes. After a series of accidents he turned to the world of yachting, but his desire for speed remained undimmed: he wanted to build very fast superyachts. “I went to around 15 shipyards all over the world and said I wanted to go at 50 knots with whatever horsepower in a 130-foot boat. Half the yards thought I was mad.” The successful businessman then simply founded his own brand, Millennium Superyachts, to make the dream come true. Several superyachts followed, but the highlight so far is definitely The World is not Enough. Designed by Dutch company Mulder Design, the motor yacht was then built under Staluppi’s brand in 2004. The sleek exterior, with its timeless elegance and classic lines, gives no indication of the sheer power within: two gas turbines and two diesel engines work together to generate 20,600hp. With a lightweight aluminum superstructure and a weight-optimized interior fit-out, the 42m boat can cruise at 57 knots. Depending on which source you believe, its top speed is either 66 or 70 knots. According to industry website Boat International, the only other superyacht that can reach similar speeds is Almashar, built in 2014. Ten guests can enjoy generous sleeping quarters, a Sky Lounge and bar as they speed across the ocean. 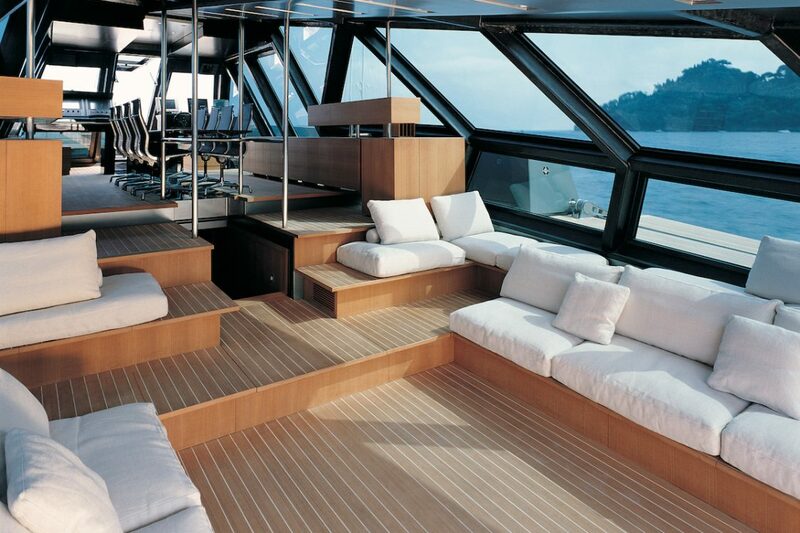 The deck offers a similar standard of luxury, having been refloored in teak in 2011. Oh, and there’s a jacuzzi too. Media reports put the price of The World is not Enough at USD 30 million. Of course you would also have to factor in the exorbitant fuel costs – especially if you like to travel at top speed. Sailing Yacht A is the successor to Motor Yacht A – in both cases the “A” is for Aleksandra, wife of the owner Andrei Melnichenko. The Russian businessman has a penchant for distinctive boats. As far back as 2008 he began work on the design for Sailing Yacht A with professional support from Philippe Starck and Claydon Reeves. 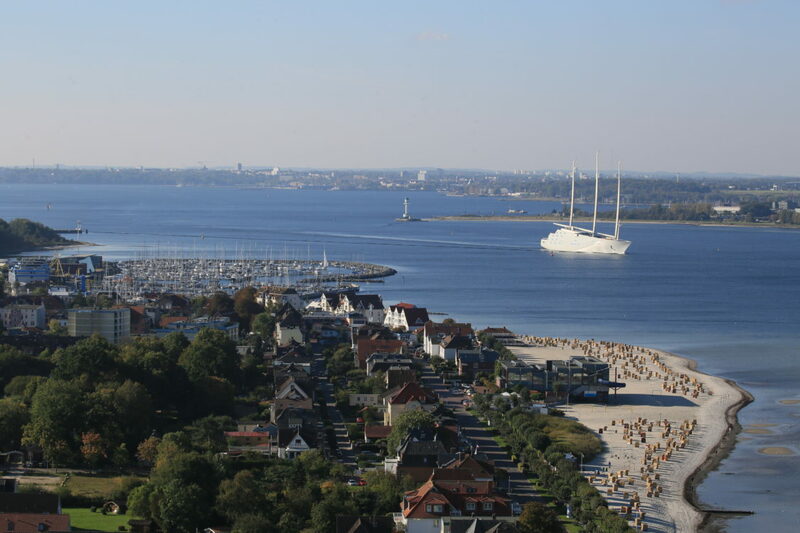 The yacht has been under construction at the Nobiskrug shipyard in Kiel (Germany) since 2012. At 147 m long, it’s one of the ten longest yachts in the world, and the biggest sail boat of all. The specialists building Sailing Yacht A are breaking new ground in several respects. Its three 100 m carbon masts are the highest free standing structures of their kind. 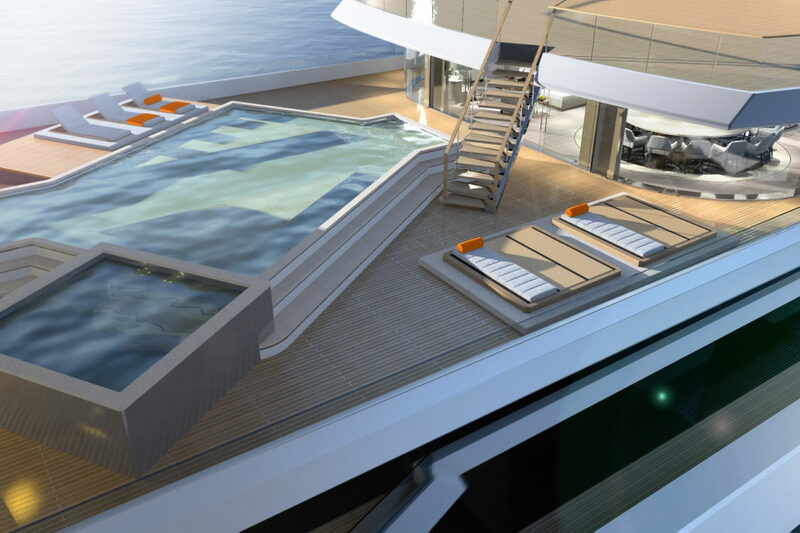 And its helipad, hardly a standard feature on a sailing yacht, presented the designers with a tricky conundrum. Technologically, the fully electronic control system, is a particular challenge. The power of two diesel and electric motors has to be coordinated with the propulsion delivered by 3,747 square meters of sail, facilitating a cruising speed of 16 knots and a target maximum speed of 21 knots. Detailed modelling and extensive wind tunnel testing have helped refine the set-up, as have the test runs that began on September 21, 2015. Previously, designer Philippe Starck has always integrated historical references into his boats, but Sailing Yacht A seems free of traditional influences. In addition to the three distinctive curved masts, the vessel’s external form is characterized by sides that tower high over the water – very unusual for a sail boat. When Sailing Yacht A is delivered in 2017, Melnichenko should have enough space for himself, his family, guests and all manner of entertainment. It’s already clear that one of the biggest highlights will be the underwater observation room with its large, 30 cm thick glass windows. It goes without saying that everyone involved is being tight-lipped about the other facilities on offer. Presumably they will be no less extensive than those on Motor Yacht A. Journalists were recently allowed to make a video on board that boat, possibly as part of a sales promotion. Media reports suggest the price will be around USD 300 million. In 2008 the motor yacht would have cost around EUR 200 million. 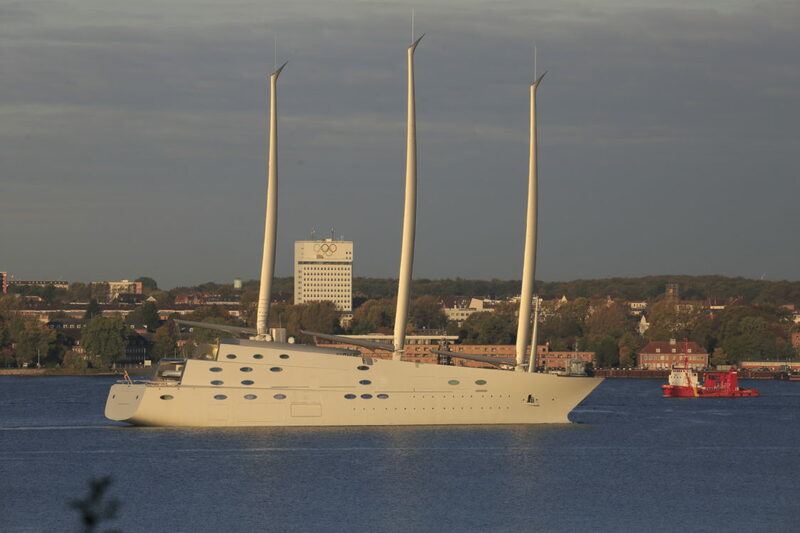 For his new toy, Sailing Yacht A, Melnichenko will have to pay another EUR 400 million. It’s probably not a record that will last forever, but since 2013 the motor yacht Azzam, at 180 meters, has been the longest superyacht in the world. With a price tag of USD 600 million, it is also one of the most expensive, and that figure doesn’t even include the on-board submarine and missile defense system. If and when it loses its title as the world’s longest, its elegant Italian design, by Nauta Yachts in Milan, will ensure that Azzamremains a head-turner in every harbour it visits for many years to come. The design is all the more impressive when one considers that Azzam was the Italian team’s first attempt at a superyacht. It was built for Sheikh Khalifa bin Zayid Al Nahyan, President of the United Arab Emirates, who asked the chairman of his private office, Mubarak Saad Al Ahbabi, to take charge of the project. Al Ahbabi put together a team of renowned specialists, which alongside Nauta Yachts included the German shipbuilder Lürssen. As well as a timeless and innovative design, the brief required the boat to be fast. Azzam reaches its top speed of 30 knots with the help of the 94,000hp produced by two diesel engines and two gas turbines, which deliver their power through four pump jets. The hull is made of steel, but a lighter aluminium is used for the superstructure. In keeping with the overall style, the deck floors are made of teak. 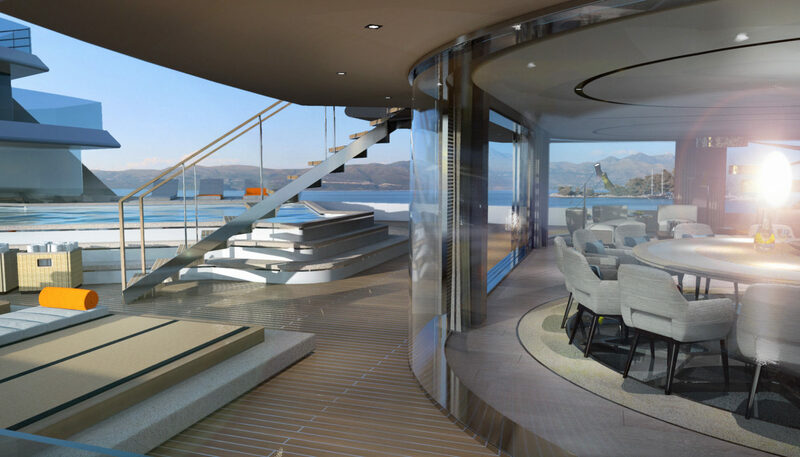 The interior design of the seven-storey yacht was masterminded by Christophe Leoni. The Frenchman has apparently themed everything in empire style, with gold fittings, marble pillars and Romanesque motifs. One of the most impressive rooms is said to be the salon, which offers 520 sq. ft. of floor space without a single pillar. For reasons of discretion, any further details are, of course, very hard to come by. 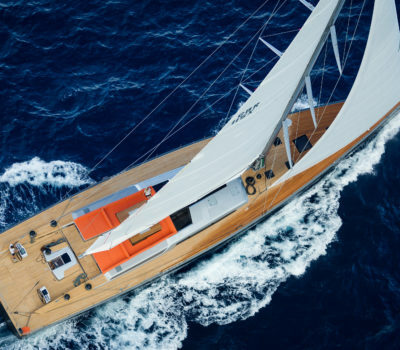 Nikata is one of the fastest luxury sailing yachts. Its stripped-back, classically elongated design appeals to traditionalists and lovers of modern design alike. The critics like it too: in 2016 the yacht won both the World Superyacht Award and a Showboats Design Award. Its design also underlines the yacht’s sporting ambitions. Despite its traditional appearance, the shape of the boat was created on the computer to extract the best possible performance. Chief designer Rolf Vorlijk knows all about speed. In 2003 he designed the high-tech racer Alinghi, which bought the America’s Cup to Europe for the first time. 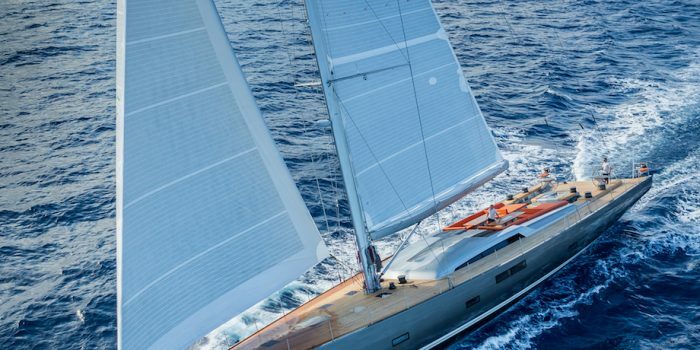 It seems that Vorlijk has successfully implanted similar genes into Nikata: when the yacht made its initial trip from Finland to the Caribbean, it reached a top speed of 29 knots. The hull and superstructure were made by Baltic Yachts in Finland out of carbon sealed with synthetic resin, which gives a very smooth finish. Overall, the boat is also very stiff, which further boosts its performance. The deck has a very traditional teak flooring. Thanks to all these various factors, the yacht is very light for its size, with a displacement of around 88 tonnes. Despite the focus on performance, the design teams at Judel-Vrolijk and Nauta Design Milano have also managed to pack in plenty of luxurious features and a high degree of practicality. The 35 m yacht offers room for ten guests in five cabins. They can relax below deck at the bar or in the chill-out room. Polished oak and natural linen fabrics were used for the interiors. The designers have also made it easy to come on board, with an extendable platform at the stern facilitating access to the teak deck. The same platform makes access to the water just as convenient. The boat’s noise-reduction features are anything but standard. During development, much attention was devoted to the design of machinery mounts and shock absorbers, all with the aim of making Nikata a particularly quiet yacht. Just a few days after its maiden voyage across the Atlantic, Nikata took part in the Caribbean 600. It won the superyacht category in the prestigious regatta and also did extremely well in the IRC Division. The winner of the Millennium Yacht Design Award when it was launched in 2002, the 36m Galeocerdo still looks extravagantly futuristic. This head-turner reminds some people of Darth Vader, and others of a stealth bomber. Its futuristic exterior certainly helped the yacht earn appearances in Hollywood films like “The Island”. The boss of the firm that built the boat, Wally Luca Bassani, believes the model, a Wally Power 118, is probably the perfect brand ambassador. His boatyard in Monaco revels in its reputation as an extremist in the world of boat building – for both sail and motor yachts. Well-known co-owners such as Giovanni Agnelli and Juan Carlos I of Spain back its adventurous approach. The Galeocerdo has a V-shaped hull, keeping the boat stable even at high speeds. It’s made of fiberglass, and above the water line out of a combination of carbon fiber and fiberglass. The very dark, shiny metallic green paintwork is intended to reflect the scene around the generous flanks of the boat particularly clearly. 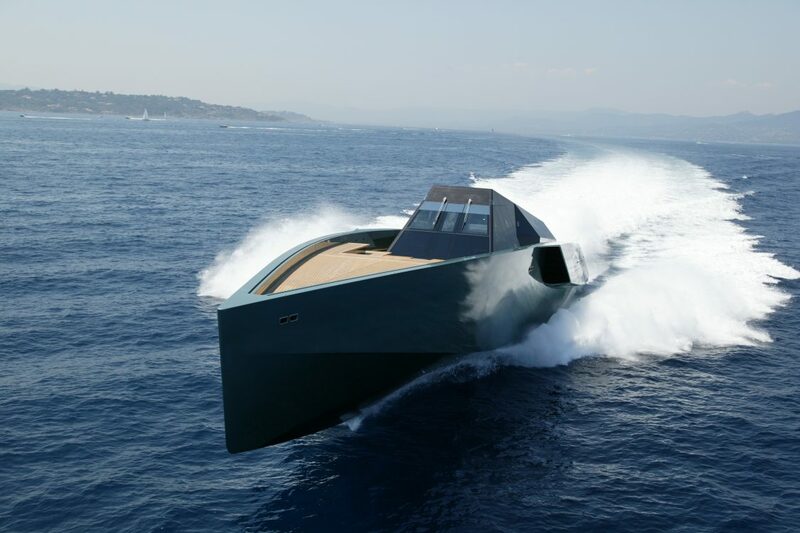 The speedy yacht’s superstructure is made of large glass sheets on a carbon frame. Because of its speed, aerodynamic efficiency was more of a factor then for slower, more traditional designs. This aspect was refined in Ferrari’s wind tunnel. The aggressive look of the exterior matches the machinery it conceals: a combination of diesel engines and gas turbines generates almost 17,000hp, which can take the vessel up to 60 knots. At these speeds, however, the range is limited to 300 nautical miles. Cruising at 9 knots, a Wally Power 118 can keep going for 1,500 nautical miles. The engine room has been heavily sound-proofed to prevent excessive noise even at high speeds. 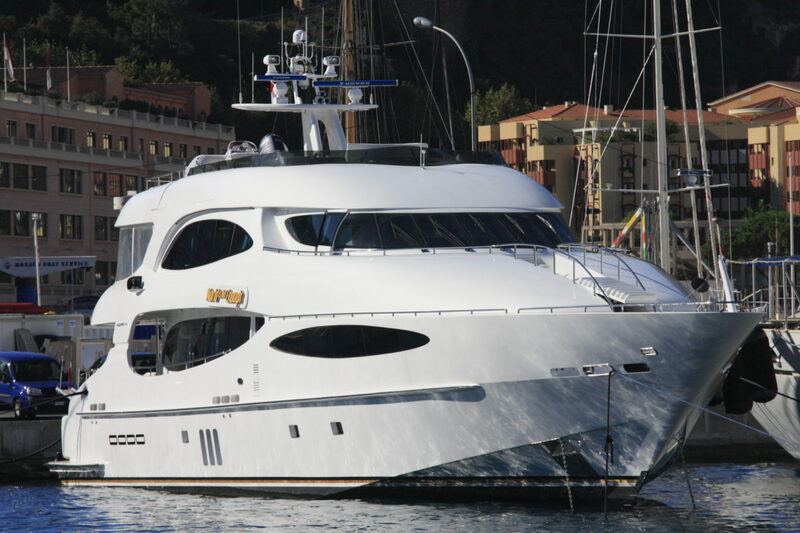 There is not quite so much space for passengers as on other superyachts, with quarters for six guests. However, there is still room for jet skis and a dinghy. Rome-based architect Lazzarini Pickering was responsible for the speedster’s interior design. They developed a clear visual language that conveys elegance while still matching the modern exterior. Depending on the engine and fit-out required, the Monegasque manufacturer will sell you a Wally Power 118 for upwards of EUR 14 million. The Galeocerdo itself apparently cost USD 33 million.